Preparation is key to a successful event. Don’t be caught off guard! Allow yourself plenty of time to apply for permits and order your supplies, like cups and wristbands too. Decide on service hours, a work schedule for your volunteers, and create a timeline for your event. Apply for use of Facility. Using GDRD facilities? Don’t forget to fill out GDRD “Event Plan” Application 6 weeks prior to your event. Click for form. 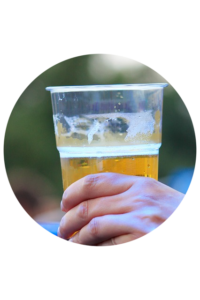 Order your supplies: It is recommended you use clear cups that are distinguishable from non-alcoholic beverage cups and increase visibility and using wristbands means you don’t have to card customers every time. You can also have wristbands printed with your own message or advertisement. Got Cups? Need Cups? Clear Cups are best! Determine your hours of service. Many event coordinators, with the support of their local law enforcement agencies, are ending alcohol service one hour before the end of an event to promote safe driving on the way home. Training. Assign one person to be in charge of checking in with all of your servers. That way everyone knows what the plan is and who to check with if they need assistance.